2013 was an interesting year for me - plenty of good, plenty of bad, and I certainly can't say it was boring. My job and other things have kept me from knitting as much this year as I have in years past, but looking back I am actually surprised at how much I accomplished. If I had to reduce my 2013 to one thing, fiber-wise, it would be fleece. My very first FO post of the year was knit from yarn spun & processed from raw fleece (that Calorimetry remains my constant companion this winter, too). My fiber storage quickly filled up with gorgeous fleece over the course of the year - especially as I learned the versatility that some fibers offer. I even fell in love with some wool I never thought I would. I delved further into spinning this year, enhancing my experience with many new tools - a niddy noddy for skeining, a set of Valkyrie combs which I adore, a book charkha and, most notably, my first full-size spinning wheel. In knitting, I began to further explore colorwork - knitting beautiful Bunty Mitts and some wibbly socks, casting on the engaging Leighton House handwarmers, and knitting a sweater with a touch of stranding (and a matching hat!). I think my favorite FO of this year though, and also the very last, was a handspun scarf I knit for my sister out of natural Shetland lambswool. 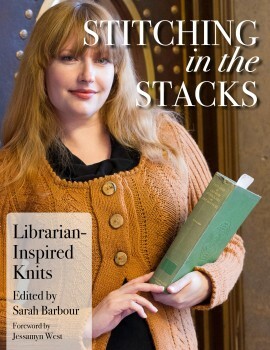 My designs were published in two books, Stitching in the Stacks and American Sock Knitting, which was really a thrill. I also had a lot of fun writing up an interactive gift-knitting guide for time-strapped knitters. Plenty of interesting things happened this year. A robot came to visit Knit Night. I wound the biggest center-pull ball, like, ever. I also foraged some wool from some very unusual sheep. Ravelry came out with some awesome spinning features and Etsy finally added instant downloads. Finally... Last year I published a post on my knitting resolutions for the year. How did I do...? Knit at least one FO from stash, per month: I knit 6 FOs from stash, out of 14 total FOs for the year. So, I didn't meet this goal. I wasn't expecting the massive mojo loss I've had lately which has led to fewer FOs overall. I also have 3 WIPs that I have started from stash yarn, which would bring me up to 9 projects if I finish them. Stashdown: My original goal was to reduce my Ravelry stash to 134 stashed yarns - I met this goal! Just barely - I have 132 yarns in my Ravelry stash. I also participated in a stashdown this year, resolving to knit more than I bought - I met this goal too! By my calculations, I bought 6300 yards of yarn (whoa) and I knit 6400 yards. A net loss, but a rather small one :\ I'll be continuing the stashdown into this year. Personal sock club (6 pairs): I finished two pairs of socks, cast on two more, and finished one pair that wasn't part of the sock club. Failed.